Welcome to Mpumalanga – a province rich with beautiful scenery and spectacular game viewing! On arrival at the charming Kruger Mpumalanga International Airport you will be met by your driver for your road transfer to Buhala Lodge. Buhala Lodge is an enchanting colonial style thatch roof lodge with a spectacular setting on the southern banks of the Crocodile River, overlooking the famous Kruger National Park. With ample outdoor veranda space on which to relax and unwind whilst viewing the wildlife that regularly visits the waters of Crocodile River, the family owned lodge is known for its fine cuisine and exceptional wine list. Buhala Lodge is a tranquil haven in which to relax and unwind and take in the natural beauty that surrounds you. Spend a total of two nights at Buhala Lodge on a Dinner, Bed & Breakfast basis including a full day game drive in the Kruger Park on day 2. Bid your hosts farewell and enjoy a road transfer to the southernmost point of the Kruger National Park, known as the Mpanamana conservancy. Your accommodation is booked at Camp Shawu – a small and intimate camp overlooking the Mpanamana dam. 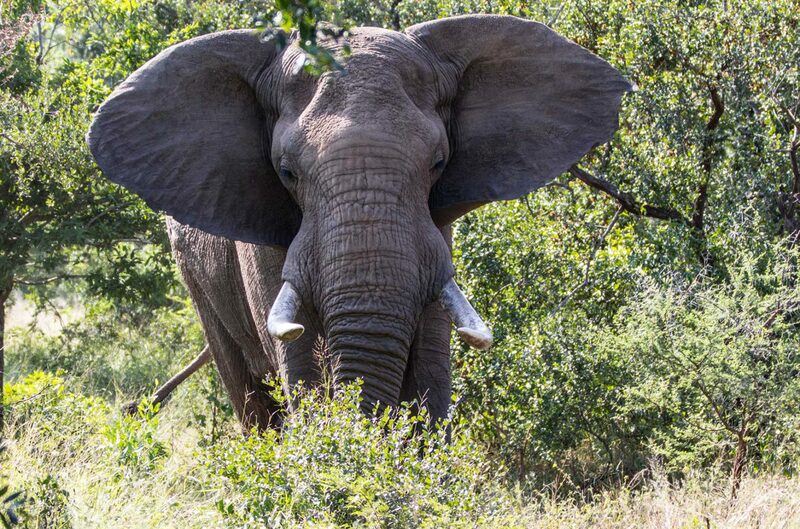 Camp Shawu named after the most famous of the African elephants, the Magnificent Seven. ‘Shawu bull’ roamed the valley here for sixty years. With the longest tusks ever recorded in South Africa, Shawu commanded instinctive respect and admiration from all who gazed upon him. Those lucky enough to have encountered this awe-inspiring bull say he took your breath away. Camp Shawu aims to do the same. With authentic buffalo dung walls, Camp Shawu captures the spirit of the ‘real Africa’ described by famous explorers of colonial times. This camp is situated in a 15,000 hectare private concession in South Africa’s world-renowned Kruger National Park. Private decks overlooking the Mpanamana Dam, allow guests a privileged view of game gathering to drink. Spend a total of two nights at Camp Shawu on a Full Board basis inclusive of two game activities per day and sundowner drinks. Leave the African bush behind as your itinerary takes you to the warm waters of the Indian Ocean today. Your road transfer from Kruger ends at the Maputo Marina where the Machangulo boat will take you across the bay. Your beach destination, Machangulo Beach Lodge, is set up on sand dunes in between the dune forest affording its guests spectacular views of the ocean and Inhaca island. With three different accommodation categories, there is something suitable for everyone, from those wanting either spectacular views or the convenience of easy beach access. The friendly team are known for their warm hospitality and ensuring that your stay is truly magical. Enjoy a variety of activities on offer ranging from superb deep sea fishing, snorkelling in the Inhaca Marine Reserve, kayaking in the mangroves to spa treatments. Or simply walk along endless, deserted beaches as you soak up the beauty of the area. Start planning your next visit to Southern Africa whilst en route back to Maputo city. If time allows between transfers, we recommend a city tour of the intriguing capital of Maputo. From Maputo you can either connect back to Johannesburg’s OR Tambo Airport from where you will fly back home or take one of the direct international flight options. Road transfer from Buhala Lodge to Shishangeni Lodge, followed by transfer in open game viewing vehicle to Camp Shawu. Two nights accommodation at Camp Shawu on a Full Board basis inclusive of two game drives per day and sundowner drinks. Road transfer from Maputo Marina to Maputo Airport (Maputo City Tour is an optional extra and not included as a standard in the package price). Travel Insurance – essential for travel to Africa. All visa and passport related costs.